In the last 10 years fundamental innovations have succeeded to new technologies in non-destructive testing (NDT), especially in the development of new detector systems for mobile inspection. To these new principles of technology belong e.g. line scan technique with a high resolution . A highly sensitive radiometric line camera was assembled together with an ultrasound-manipu-lator (US-manipulator) and an x-ray tube to test this technique for the improvement of the radiation technique. Circumferential welds were scanned and an improved image quality was obtained for pipes with about 10-20 mm wall thickness in a reasonable measurement time. Significant improvements of the image quality were achieved for testing of water filled pipes. The technique can be extended by multi angle inspection to improve the detectibility and depth evaluation of cracks and lack of fusion. Tomosynthesis enables the calculation of three dimen-sional presentations from the multi-angle projections. This improves the evaluation of indica-tions, like cracks, lack of fusion and undercuts. 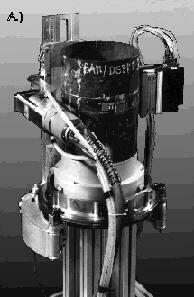 A modified radiometric line camera  was assembled together with an adapted ultrasound-manipulator and a mobile 225 keV x-ray tube (fig. 1). The developed device (fig. 1) permits to scan circumferential welds with a scan width of about 100 mm. The pixel resolution amounts to 50µm for 2048 pixels per line. Corresponding to fig. 1 the camera and the x-ray tube are separated on the pipe by an angle of 180°. They are moved line by line around the circumference to acquire the radiometric image. The applied principle of line scanning yields several advan-tages in comparison to the film radiography. The radiation direction corresponds to the central projection technique which al-ways enables radial penetration. All radial flaws are detected with maximum contrast. The special slit collimator of the camera reduces the intensity of the scattered radiation significantly. The well adjusted system (fig. 2) yields therefore better image quality than film radiography for pipes with thick walls and especially for water filled pipes. The developed system provides radiometric images with high image quality for a penetrated steel thickness of 4 - 46 mm (2 - 23 mm wall thickness) in a comparable time to manual radiography. Due to the limited resolution of the applied camera of about 160 µm (measured with double wire IQI by EN 462-5) the optimum application range covers wall thicknesses of 10-25 mm from the present point of view. The testing of higher wall thicknesses is also possible but requires the modification of the used line camera. The description of the line camera design is outlined in [2-4]. After a few modifications the camera could be operated near the physical sensitivity limit. The spectra of different x-ray tubes and g-sources were calculated to simulate the detector properties and the expected sensitivities in dependence on the wall thickness of steel and the measurement time [4, 5]. Only x-ray tubes enable the application of the line scan technique in a reasonable time which is comparable with the manual radiography technique and its image quality. The line camera yields a sensitivity of about 90% of the calculated physical limit up to about 35 mm penetrated steel thickness at 225 keV. One of the major tasks of the in-service inspection of circumferential welded steel (also austenite) pipes is to distinguish between undercuts and crack corrosion. The depth information of the radiometric indications can be an essential tool for this evaluation. The basic problem of radiography as well as of the radiometric scan technique is the dependence of the measured crack contrast on the radiation direction in relation to the crack location. Only parallel transmission to the crack plane (or to the greatest planar area) provides a sufficient contrast. This requires the application of the multi-angle technique. The available scanner enables the modification of the radiation direction. It is possible to set up the system for a special inspection of side wall flaws. Scanning the weld under different angles provides multi-angle projections which improve the probability of detection for flat inhomogeneities in the material like cracks and lack of fusion. The above described technique of measurement enables the depth evaluation of indications by means of the laminography and/or planar tomography. Laminography describes the method and geometry for measurement and reconstruction. It is applied if the complete access to all sides of the object is limited. Due to the limitation of the applicable projection angles the laminography is considered as "limited data"-technique. Tomosynthesis describes the variety of the algorithms for reconstruction from limited number of projections. Concerning to precision and effort the laminography as a 3D - testing method is established between the computer-tomography (CT) and the multi angle-radiography. Fig 3: Variants of the Digital Reconstruction - The different Methods of the reconstruction determine the applied method and geometry of the data aquisation. Fig. 3 shows the principle of the application of the multi-angle technique. The X-ray tube is shifted in the direction to the pipe axis step by step. For each step a full 360o scan is taken. In contrast to the X-ray tube the line camera is not shifted parallel to the pipe axis. This algorithm corresponds to the coplanar translational laminography  transformed to a cylinder coordinate system for the inspection of pipes. If the X-ray tube is shifted parallel to the pipe axis and additionally, corresponding to fig. 3, each step is combined with an angular shift (pre-scan and post-scan), the principle of coplanar rotational laminography can be applied . Due to this analogy between the configuration of multi-angle technique and laminography the three-dimensional (3D) reconstruction of the weld is possible. Corresponding to fig. 3 either all measured radiometric scans can be measured or (and) the weld can be inspected plane by plane from the reconstructed 3D-data set. The modified filtered backprojection was found as the most effective reconstruction method regarding the reconstruction time and the image quality. Also good results were achieved with the average - method combined with high / low pass filter  and the symmetry analysis on the basis of a covariance - analysis . As example fig. 4 shows the reconstruction of a crack indication in a austenitic pipe by means of the average - method. For high accuracy applications the principle of planar tomography is also applied. The X-ray tube is shifted corresponding to fig. 5 parallel to the pipe axis only and the camera is located opposite to the X-ray tube below the weld to inspect. During the movement of the X-ray tube 200...400 projections are acquired in a radiation angle range of up to ±30°. The camera is not shifted for each set of projections. Planar tomography provides undistorted reconstruction results for cracks and lack of fusion if the defect plane is oriented inside the inspection angle range. Artifacts arise for volumetric indications, only due to the missing projection angle problem. The used reconstruction is based on a modified filtered back projection. This algorithm is a typical analysis method and is applied for cross-sectional analysis of preselected regions of interest. The measurement time for one set of projections amounts up to 6 minutes per cross-section depending on the wall thickness (8...20 mm). The reconstruction time is about one minute on a PC. Fig. 6 shows a typical indication of a crack in an austenitic pipe weld. 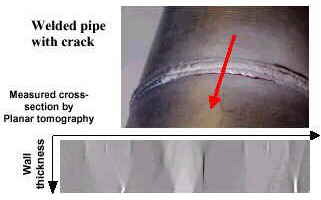 The evaluation of indications for open cracks and undercuts may be distorted by artifacts. The exact knowledge of the surface allows the exact determination of the distance between outer wall and crack tip. The knowledge about the inner wall profile enables furthermore the measurement of the wall thickness profile. Surface indicators were developed to obtain the missing information about the surface in the reconstructed images. The surface indicators are composed of wires (e.g. copper - brackets), which are situated to defined equidistant positions on the surface, vertically to the weld (fig.7). Fig 7: Surface indicators on a pipe wall. The cross section and surface profile is calculated along the line. Fig 8: Results of the reconstructed cross section area before (a) and after (b) high pass median filtering. The figures 8a and 8b present the reconstructed cross section of the pipe wall in a defined reconstruction space. Triangular artifacts are recognized in fig. 8a above and below the indicator marks, which make it difficult to determine the surface profile. These artifacts are reduced (fig. 8b) by the application of a high pass filter on the basis of a 1-dimensional median filter (equ. 1). The wall thickness, respectively the depth of an indication (e.g. crack) relatively to the surface profile, can be determined qualitatively and quantitatively through the measurement of the distances between the inner and outer surface. A highly sensitive radiometric line camera was assembled together with an ultra-sound-manipulator and applied for multi-angle inspection of pipes. Enhanced image quality (as compared with film radiography) was obtained for the inspection of circumferential welds of pipes with about 10-20 mm wall thickness. These measurements were performed in a nuclear power station under in field conditions as well as in the laboratory. A significant increase of the image quality was achieved for testing of water filled pipes. The new technique enables the inspection of filled pipes with a similar quality like film radiography provides for testing of empty pipes. Methods of nonlinear tomosynthesis were used for the treatment and interpretation of the measured projectional data. The elaborated system enables to enhance the detectibility and evaluation of the depth of cracks and lacks of fusion. Tomosynthesis with special image preprocessing enables to enhance the detectibility of cracks and to extract the information about their shapes, structure and depth. Special statistical approaches for the enhancement of accuracy are investigated now. The consideration of these possibilities is beyond the limits of this paper. Furthermore, there exist the possibility to enhance the tomosynthesis by consideration of a priory knowledge in a post iterative process. Interesting first results have been obtained by . B. Redmer, Y. Onel, U. Ewert, H. Diener, J. Müller: "Automatisierte Schweißnahtprüfung auf der Basis eines Zeilenscanners", Jahrestagung der DGZfP, Dresden, 5.-7. Mai, 1997, S. 769-776. R. T . Bernadi: "Steel weld inspection with digital radiographic line scanning", ASNT 1993 Spring Conference, 29.3.-2.4.93, Nashville, TN, USA, pp.78-80. S. Zolotarev, V. Vengrinovitch, G.-R. Tillack: "Finite series expansion method modified for multi-step reconstruction from limited number of projections and views"; Computer Methods and Inverse Problems in Nondestructive Testing and Diagnostics (CM NDT-98), Minsk 1998, pp.185-192.